Knowing the benefits of milk and honey, Oriflame has created the indulgent Milk & Honey Gold collection. Offering a wide range of nourishing and rich formulations for your face, hair and body that provide you with the ultimate pampering experience. 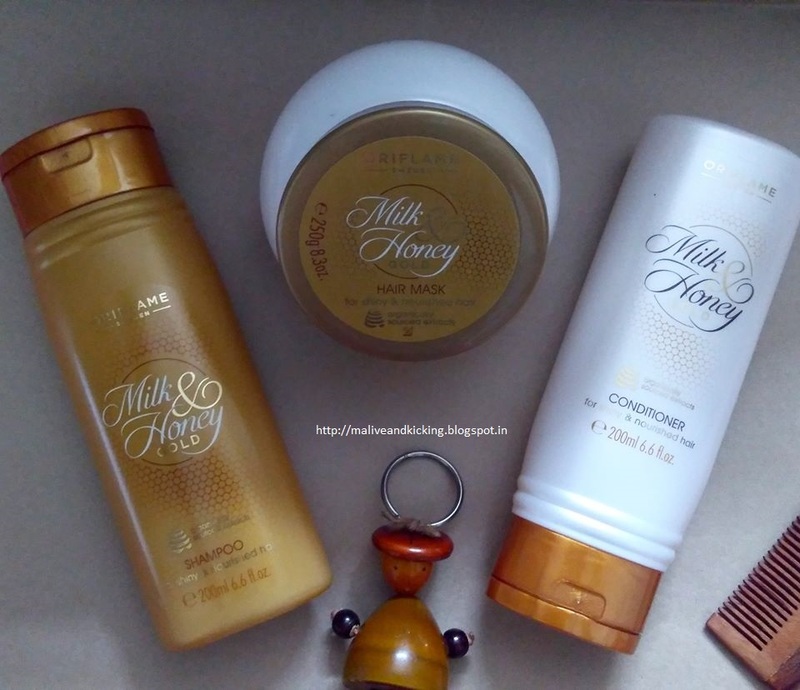 In this post, I'll cover hair treatment products that I tried in past weeks...The Milk & Honey Gold hair care range consists of 3 products that all of us would need i.e. Shampoo, Conditioner and Hair Mask. Luxurious, intensively nourishing shampoo infused with organically sourced extracts of milk and honey, which moisturise and condition for hair full of natural shine. Gently cleanses and nourishes while the voluptuous foam and exquisite milk and honey scent offer a truly indulgent experience. Rich and creamy conditioner infused with organically sourced extracts of milk and honey. The exquisitely fragrant formula conditions and detangles hair to leave it smooth, soft and with a gorgeous natural shine. Luxurious, intensively nourishing hair mask infused with organically sourced extracts of Milk and Honey, Shea Butter and Wheat Proteins. Helps to restore strength, shine, softness and vitality, while a sprinkle of golden pigments add a subtle shimmer. 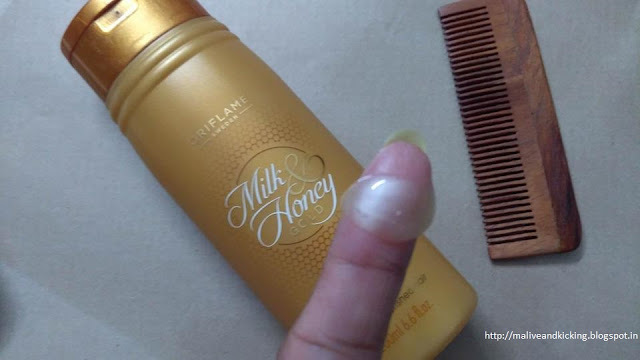 As many of you might have apprised already that the key ingredients of this Milk and Honey collection is aied to give intense nourishment to your hair. This collection basically targets to repair the issues or damages caused to normal-to-dry hair. My hair type is normal and it's not very difficult to manage my tresses if I just follow normal cleanse-condition-nourish routine. The only concern that I take care while choosing my hair care products is to pick mild products that do not worsen any existing issues. Milk & Honey Gold collection sounded quite gentle by its name and I had to give it a shot. The first look at the colour theme of the packaging in ivory & golden resonates the main ingredients. It's looks simple yet classy. The shampoo and conditioner come in tall plastic bottles, while the hair mask comes in a cute round pot that resembles traditional earthen pots of olden times. I usually massage my hair and scalp with a coconut oil before shampooing which sets the initial step of hair treatment. It not only improves blood ciculation, but also contributes to hair growth rate. 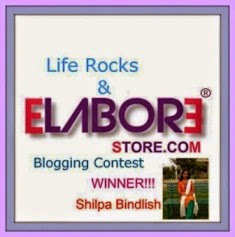 I feel so relaxed after a good 'champi' when the oil penetrates deep into scalp. You should choose a hair oil that suits your hair type. For the drier hair, one can prepare a concoction of oils that can treat dryness. Washing my hair with a mild shampoo is the next step that should cleanse my scalp off all the dirt etc. 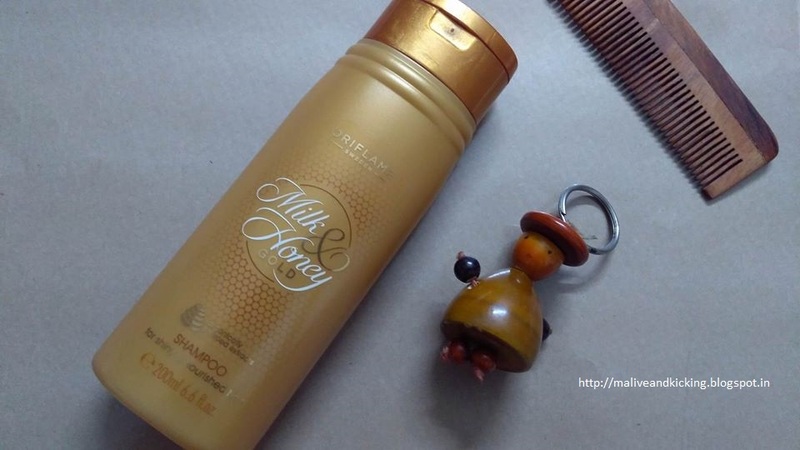 The milk & honey gold shampoo is not harsh and can be used upto three times a week. This shampoo is light gold in color and has thin consistency but lathers well. The shampoo comes off easily from hair and doesn't leave my scalp itchy after rinse. One should prefer using fresh water or lukewater to take a headbath, depending on the season. After shampooing, the focus is on nourishing, repairing, softening and volumizing your hair. This job can be done by a good conditioner like Milk n Honey Conditioner. This conditioner is in a thick cream texture of off-white color. It is like a quick fix to manage unruly strands. Just ensure to apply the conditioner in apt quantity, else it may make your hair look bit sticky. This one is rinse-off product, so has to be on hair for a few minutes and washed afterwards. 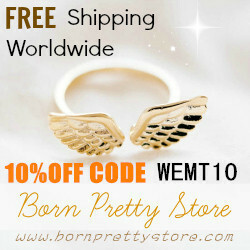 The dry hair would find it really moisturizing capable of offering right amount of smoothness. The magical product in the process of hair treatment is the hair mask. 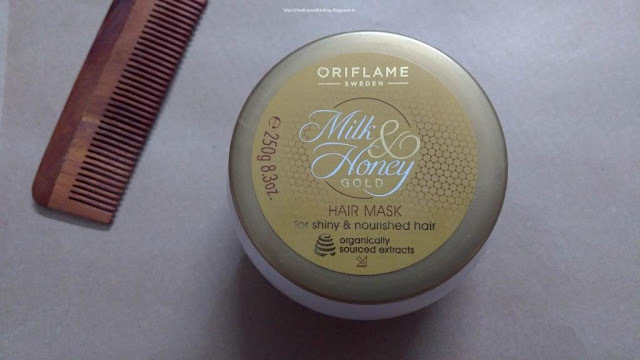 Milk & Honey Gold Hair Mask is a luxurious creamy product that spreads of hair like a dream. Many pople would think that hair mask is meant for getting glossy, silky hair. But actually it's an effective product to pack all the required nourishment to your hair and scalp. Well! you certainly get that shine and untangled mess as a bonus. The issues like roughness, dryness and frizzyness of hair come under control with an application of suitable hair mask. Just have patience to leave it on hair for few minutes and rinse it off to transform your dream of soft-silky hair into reality. All three products smell really beautiful. Though the fragrance lasts only for a while time after rinse, but I can smell a quick whiff of fragrance locked in interlaced strands of my plait or bun whenever I open my hair after coming back home from work. Not just my hair look n feel healthy, I feel delighted to have a ultimate product range at my disposal that works well for my hair and lend it great texture. You will like it, I am sure. Mask is a quick fix for hair certainly. 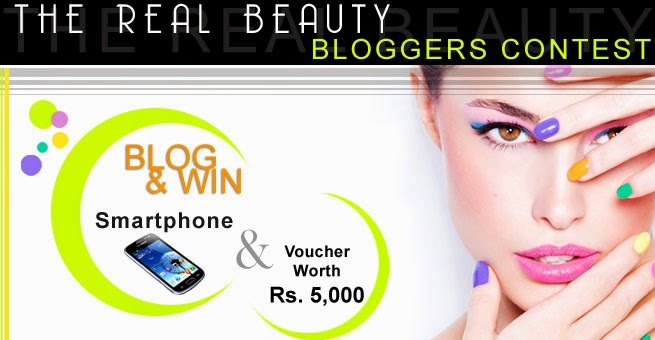 My pleasure :) It's a gret set of products to use this raint season. coz its mild n gentle. The fragrance of this range sounds so good. 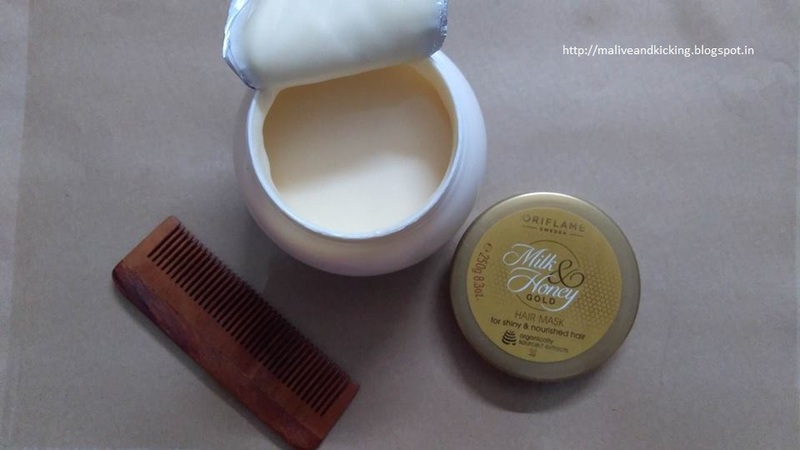 And both honey and milk are amazing products to nourish the hair. That's the reason I believed to give my hair nourishment of milk n honey.